It seems we have a new VKK on the market – a “high-end” piece regardless of its authenticity and age. For once we have hi-res images to work with, and it’s almost believably “19th century”, with a pistol that’s clearly hand-made. However, there is a lot of bright steel and fresh scratching on the under-side of the pistol. The red felt lining, though worn in places, is pristine in others and still suspiciously bright. 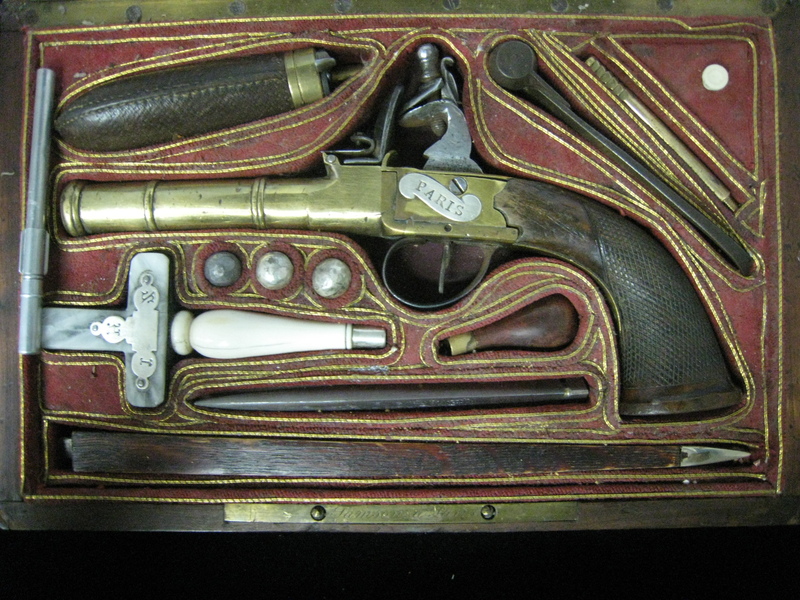 In fact the dye used in its manufacture has stained the ivory on both pistol and the case. Whatever the authenticity/age of this new kit, I thought it a good opportunity to try to make sense – if such a thing is even possible – of the some of the kits out there. As you can see from Spooky Land’s attempt to classify and categorise VKKs, it is a daunting task, as no two kits are identical, and very few are even similar, despite the precisely-worded (“Blomberg”) label that many they share. This in itself suggests many different places and persons of origin. However, there are some parallels between kits that may be significant. According to the seller of the new kit, there were three others like it from the same source. This we can’t confirm, but aside from its unique ivory case and accoutrements, this new kit is very similar to a pair of equally fancy kits sold by Sotheby’s in April 2007. A very similar fourth kit with cruciform pistol was sold by Fain & Co in 1997. 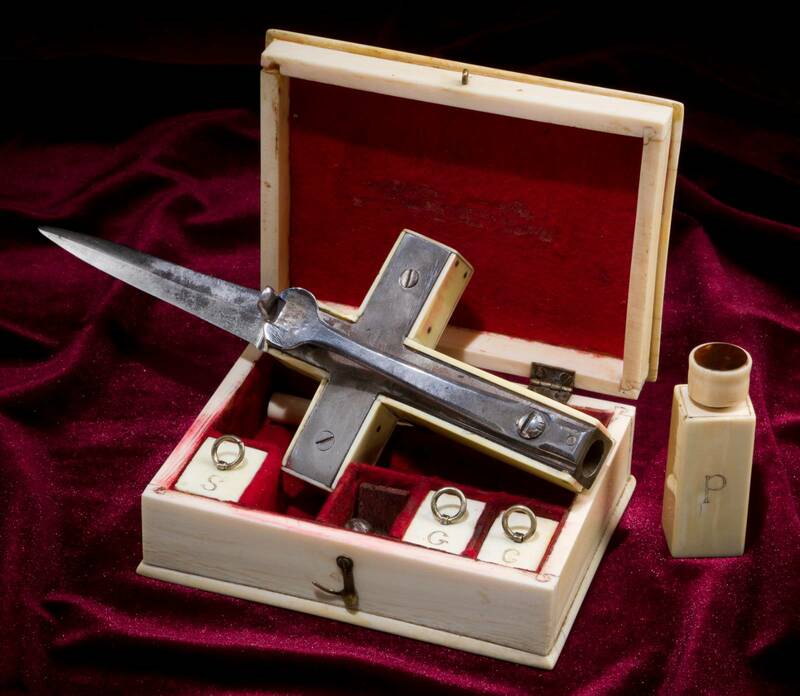 It too is really nicely done, and though without “IHS” inscription, contains that unusual under-hammer cruciform pistol. To get techy for a moment, the similarity between the pistols is far from superficial. All are muzzle-loaded, featuring a combined mainspring and (under-)hammer that is ‘cocked’ into a notch on a folding trigger. When this is pulled, the tensioned spring slaps down onto a percussion cap at the breech and fires the main charge. A crude but clever way to incorporate a gun barrel into a wooden cross-shaped stock. The Fain kit lacks the combined ramrod/stake of the Forgett piece, as well as the bevelled arms of the cross/stock on the latter (probably an attempt at ergonomics)! The new (Greg Martin) gun opts for a folding knife-bayonet in lieu of a stake. The other cross-pistols also have wooden ivory-faced cruciform stocks, where this new one is solid steel with ivory cladding. Otherwise they are clearly either by the same maker, or are close copies of each other. 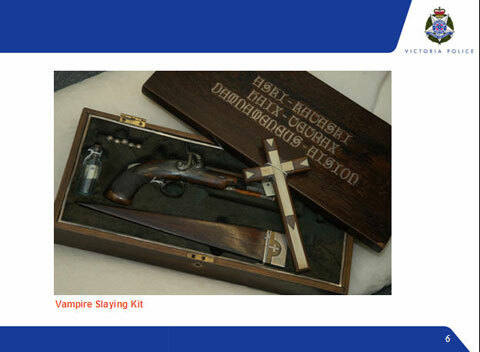 There is one other possible example of kit with cross-pistol at the Gatlinburg branch of Ripley’s, however the contents of the kit don’t seem to match their own caption. In any case, the pistol visible in that kit does have a similar underhammer system of ignition albeit fitted to a much more conventional mid-C19th pistol. Where to go from here? I decided to look for parallels beyond kits with cruciform guns. 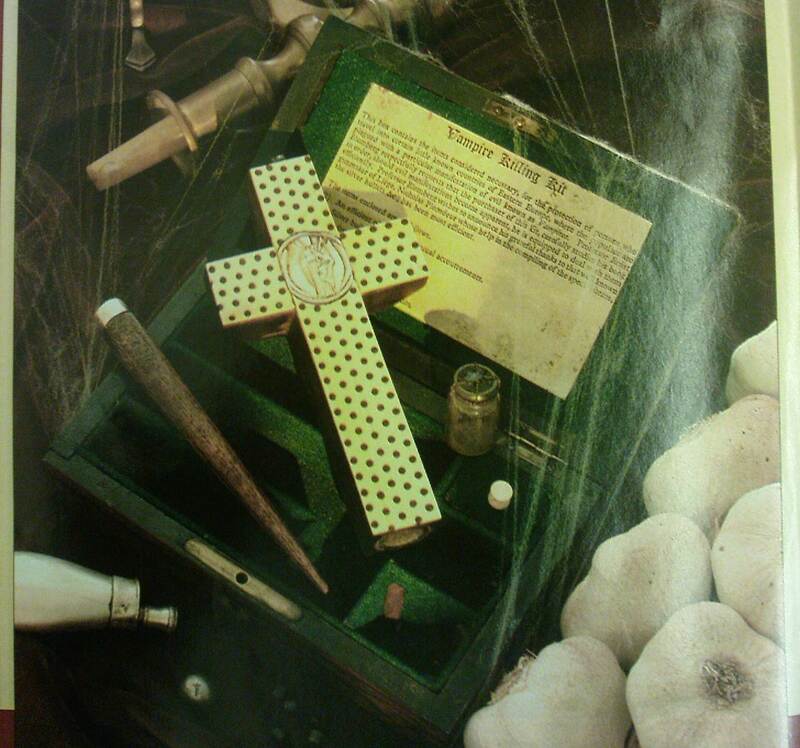 I found it in the Ripley’s kit from San Francisco, which has a cross in the same style as the guns (possibly even a gun in its own right) which, like the two Sotheby’s kits and this new example, is also ivory-clad and marked ‘IHS’. 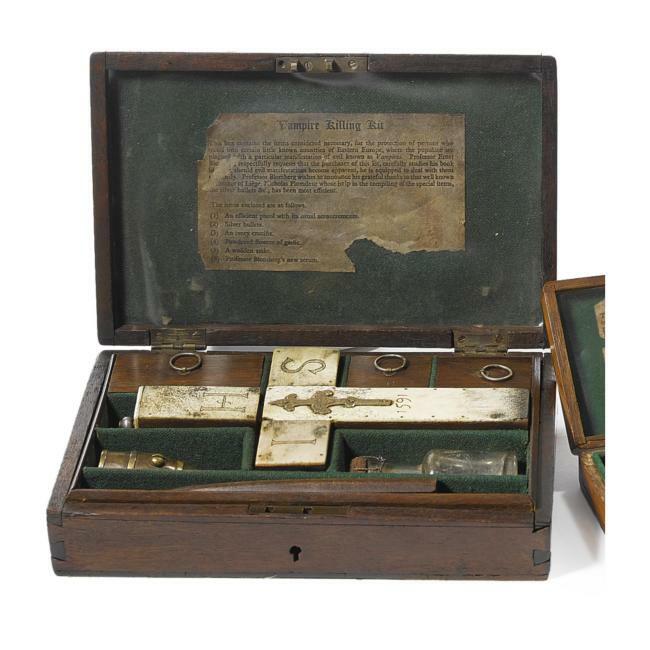 We then have yet another Ripley’s kit with what appears to be a folding plug bayonet (with silver-tipped stake attachment) for its (unusually flintlock), again marked ‘IHS’. Incidentally, despite its cheesy appearance, it is also more convincing than most kits, as the typically French case design, complete with cruciform cut-out for the bayonet, all look to be genuinely mid-C19th in date. It is essentially a cased pistol with the one specialised “anti-vampire” component, rather than the usual mish-mash in which the pistol is just one element. There are then many more kits containing small wooden crosses faced with ivory – it is tempting to include these also, but I don’t want to over-reach myself by making such tenuous connections. Returning to the Mercer museum’s kit – proven to be of modern manufacture, let’s not forget – we find yet another cross, lacking the IHS inscription but containing the same clipped circular religious medallion at its centre as the Forgett kit’s cross-gun. The author of the Guns & Ammo article supposed this to be St Peter, but given the analogies of impaling demonic creatures with long phallic objects, this is most likely Saint Michael. This probably relates to the association of St. Michael with the exorcism of evil spirits in the Catholic religion. Not really something seen with the folkloric vampire, and so tempting to take as another hint that we’re dealing with the post-Dracula era. 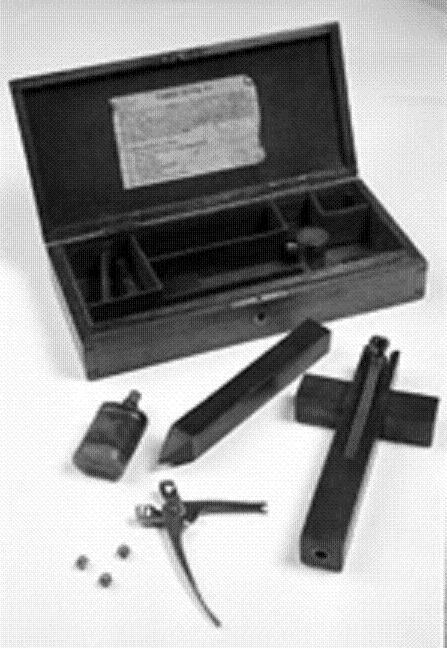 From the Mercer kit, which has silver balls marked with crosses, we can also include this kit, now in the Victoria Police Museum in Australia. This in turn takes us right back to the Forgett kit, as all three contain silver (possibly actually pewter) balls (i.e. bullets) with crosses cut into them. As I’ve commented before, the literary references for this practice date from the ’60s and ’70s. It’s a version of an old supposedly magical phrase (think ‘abracadabra’) found on the statue of Artemis at Ephesius (c500BC) – a phrase of unknown origin that was used in everyday magic and ritual in the classical world. It seems to have survived via Gnostic Christianity into the 19th century in the form found on that lid – which whatever the maker’s rationale for using it, certainly appears in Madame Blavatsky’s Theosophical glossary (Theosophy being a new age religion from the 1870s onwards). It’s still in ‘use’ today with ritual ‘magicians’ of one sort or another. The inscription is in a bizarre typeface resembling none I have ever seen (answers on a postcard). It is inlaid in a style that to me suggests mid-19th century at the earliest – but shows cleaned areas in the aged/treated wood around each letter, suggesting that they are later additions. Pistol cases typically either eschewed decoration altogether, or had an escutcheon plate or decorative shape inlaid into the centre of the lid. The lining itself is not very mid-C19th as it uses cut-out forms with finger slots instead of the usual divided compartments. I think it likely that this is a re-use of an older pistol case. What conclusions can we draw from this group of kits? Sadly, not many. Though far from being copies of each other, there are clear connections between these half-dozen or so kits that suggest a common origin. 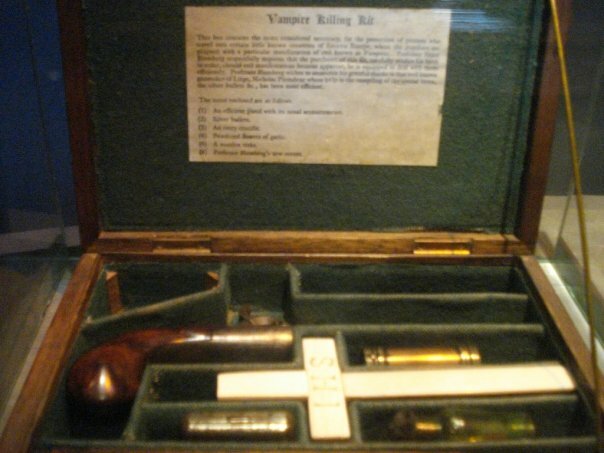 One possibility is a ‘school’ of vampire kit makers turning out multiples in order to make money. Another, just as likely, is that we are witnessing an organic string of copyists taking ideas from a kit or kits that they’ve seen and making their own version with the antique items and craft skills that they have available to them. In any case, this web of connections includes our only proven fake, casting doubt upon the others by association and to varying degrees. This doesn’t automatically make them all fakes of course. Given that Val Forgett was a replica gunmaker by trade from 1956 onwards, it would be a neat conclusion indeed if we could say that he was the originator of the Blomberg kits. However, he was also an international dealer in antique arms and armour, and claimed in the article that he bought the kit ‘at a gun show’ in the US. 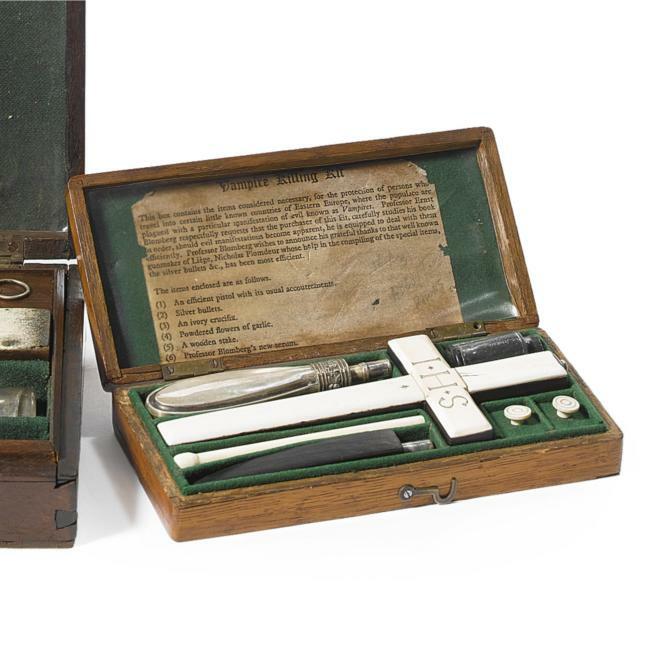 This is unlikely to be the kit allegedly sold by Michael De Winter in England in 1972, as he made no mention of such an unusual pistol. Is it the product of an imitator? As with most other questions surrounding these kits, we are unlikely to ever know unless more VKKs can be scientifically tested or at least subjected to closer scrutiny by specialists outside the auction houses that do so well out of selling them.